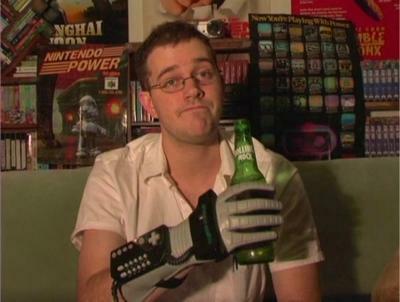 I've always been a big fan of James Rolfe, aka the Angry Video Game Nerd. He's a true Internet success story, a young filmmaker who used a simple camera to become a self made Internet celebrity. His work has grown more impressive over the years, and regardless of how lowbrow people have claimed his writing has become, the craftsmanship and effort are still there with each episode. The enraged character has been uncharacteristically silent for the last year as Rolfe has been taking his creation to the big screen. He announced his intentions to adapt his popular web series into a full length feature back in 2010, and after a crowd funding campaign raked him in a larger budget than he had originally anticipated. Shooting wrapped up in May, and now the first look at Rolfe's film is available for the world to see. The Angry Video Game Nerd and his friends seek to find the cemented landfill where the unsold Atari 2600 E.T. cartridges are buried. Along the way, the government gets a hold of his plans and attempts to continue the cover up. It seems almost unreal how Rolfe is breaking away from the Internet and turning this pet project into a true film, but that's exactly what he's doing. No, it's not Hollywood or anything like that, but there is an obvious amount of professional talent being put into this film, and it seems like the real deal. It's a true B-grade grassroots fanboy film, and with the great back story to its production, it is set to be a film every gamer should support.